It's something called National Bike Week in the UK this week and Ireland has a National Bike week for the first time, too. 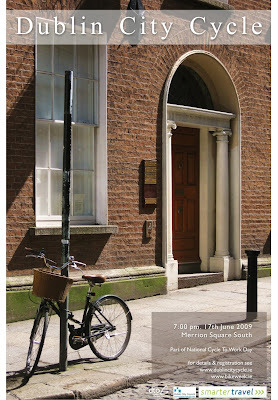 Part of the Irish week is the Dublin City Cycle on Wednesday June 17th, 2009. It's organised by the Dublin City Council, The Dept of Transport and the Dublin Transportation Office. The poster, as it was explained to me, was an attempt to remove focus from the gear of sports/hobby cyclists and to try and make the event more 'cycle chic' and appealing to average citizens. And a beautiful poster it is, too. Back to the UK event, if you Google it, the description reads "Bike Week is an annual opportunity to promote cycling as a source of fitness and fun." What about "feasible, intelligent and respectable form of transport"? Or are they just trying to get some more people riding on Sunday afternoons? Speaking of National Bike Week, The Guardian asks a number of cycling 'experts' [whatever that means] about their favourite bike routes. I describe the route from my flat to the centre of Copenhagen in the morning rush hour - it's on page three of the online article. I don't do cycling holidays. When you ride your bicycle as transport every day, all you want out of a holiday is to walk a few metres down to a beach to build sandcastles with your kids, after which you promenade down to the harbour for dinner. But hey, that's me. I understand how some people may enjoy it and that's lovely.